Politicians and the media lacking knowledge of the basics of Brexit has been well-documented on this blog, although the information vacuum is by no means confined to these groups. We see similar failures in academia and in think-tanks. However, we might reasonably have expected to see accurate and timely analyses of the effects of Brexit from business, and especially trade associations, but even there we find serious limitations on the information from this quarter – even yesterday when the report delivered for IATA contained serious errors. But pre-eminent in the misinformation stakes have been representatives of the various agricultural sectors, no more so that the National Farmers Union (NFU), the initials of which have long been thought to mean No F***ing Use – to the extent that most UK farmers are not members. And, they're at it again, as reported by the Guardian which reports yesterday's proceedings of an NFU conference in London with the headline: "No-deal Brexit could raise price of mince by 50 percent, meat industry says". According to Katie Doherty, policy director of the International Meat Trade Association, burgers and spaghetti bolognese "could be priced out of many families' reach" because a Brexit "no deal" would mean huge food inflation, "with World Trade Organisation tariffs highest on food products". I really don't know what it is about the NFU and meat industry representatives and their obsession with tariffs – although they are hardly alone in this. But one wonders why they think, if we drop out of the EU without an exit agreement, the government is necessarily going to apply tariffs to such vital things as food supplies. In fact, in the same article, the NFU is expressing its concern at the government's stated intention to lower tariffs on food imports to guard against shortages. They are worried that UK farmers would not be able to compete with low-tariff goods and could be driven out of business. The "no deal" situation, though, is far more complex than is represented by this scenario - in a sector which imported 275,000 tonnes of fresh/frozen beef in 2017, while exporting 105,000 tonnes. Of that volume, by far the greatest weight of imports comes from the EU (259,000 tonnes) with the Republic of Ireland supplying by far the greater proportion at 194,000 tonnes. Supplies from the rest of the world amounted to a mere 15,000 tonnes. UK exports, on the other hand, amounted to 105,000 tonnes, with the vast bulk going to the EU-27, amounting to 92,000 tonnes. Non-EU exports were a mere 13,000 tonnes. Now, as we know it, in a "no deal" scenario, the UK will no longer be listed as an approved exporter of products of animal origin to the EU. Variously, it is estimated that it might take up to six months to gain the requisite listing, during which period there would be no exports of meat from the UK to EU Member States. On the other hand, given that the UK is expected not to impose any barrier on the import of beef from the EU, even if supplies via the Calais-Dover link are stopped completely, we could still expect a free flow of goods from Ireland, amounting to 194,000 tonnes – or perhaps even slightly more. Assuming RoW imports will continue, the worst case is that we suffer a shortfall of (maybe) about 60,000 tonnes, as against some 90,000 tonnes which we will not be able to export to the EU, and for which there is unlikely to be an alternative market. Undoubtedly, this product will be diverted to the domestic market, creating a surplus of around 30,000 tonnes. This compares with an annual UK beef consumption of about 1.2 million tonnes, and while the market is highly price-sensitive, reacting quickly to supply fluctuations, this relatively small surplus is unlikely to have a great impact on consumer prices, especially as some can be held back and frozen. Broadly, therefore, one might expect the immediate effect of a "no deal" Brexit on the beef trade to be price neutral. But if there is an effect, we are more likely to see a fall in prices rather than increases. In the longer term, with the resumption of exports to the EU, one might expect the EU to impose tariffs, and there will also be the requirement to submit consignments to Border Inspection Posts for veterinary inspection – where there is currently a serious shortage of capacity and a lack of facilities at Calais. On that basis, it is unlikely that we will see any significant resumption of exports to EU Member States. Unless we can increase exports to the rest of the world, or reduce imports from the Republic of Ireland, the UK beef sector will be experiencing a structural surplus. This is likely to exert a downward pressure on farm-gate prices, unless there is a contraction in the industry. However, it is likely that Irish supplies will increasingly be diverted directly to the European mainland, suggesting that the overall effect of Brexit will be that the Irish will progressively capture the UK export market. Interestingly, the Guardian report claims that Britain eats more than twice as much beef as it produces and is highly reliant on imports. That, actually, is not true. It is the industry statistics which attest to the annual consumption (2017) of 1.2 million tonnes, with overall exports of 140,000 tonnes and imports of 442,000 tonnes. We have a shortfall only of about 25 percent. At the NFU conference, the situation seems to have been over-egged. As regards the market for lamb and mutton, though, there is a very different scenario. UK production and consumption, both nearly 300,000 tonnes annual, are almost in balance. Exports and imports, likewise, are roughly in balance. 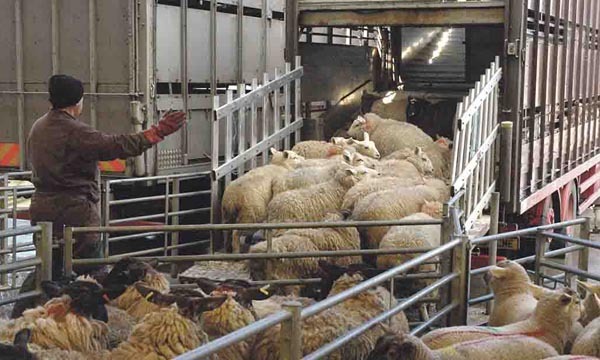 The big difference between this and the beef sector is that cross-border trade is a much larger proportion of the business, with 80,000 tonnes being imported against exports of 90,000 tonnes, the vast bulk (94 percent) going to destinations in the EU – mostly France. A collapse of the EU trade, would therefore, create a significant surplus on the UK market, as product was diverted to the domestic market, with a substantial effect on prices. The market is notoriously price-sensitive and farm-gate prices might be expected to drop well below break-even levels. The damage to the sector could be severe. This, of course, is where one might expect the likes of the NFU to focus, warning not of price increases but of a short-term collapse, with a huge impact in particular on hill farming – with serious environmental consequences. Throughout the entire Brexit saga, therefore, it has been a constant puzzle as to why farming and meat industry representatives have got it so wrong. Although in yesterday's report, we see reference to non-EU products facing 100 percent document checks, with poultry facing 50 percent physical checks and red meat 20 percent, there is no mention of the fact that a "no deal" Brexit almost certainly means that exports to the EU stop entirely, for six months or more. The EU would require the UK to be a listed third country. In the unlikely event of a ‘no deal’ scenario, the UK would apply for this status but cannot be certain of the EU response or its timing. Without listed status no exports to the EU could take place. Not once have I seen the NFU refer to this problem, even though I was writing about it in January 2017, without the advantage of either Commission or HMG input. One would also have expected the industry to have worked this out for itself. Even the Brexit impact assessment for the industry, published in October 2017, failed to mention the problem, and there was no public industry response to the Notice to Stakeholders published in February 2018. It is all very well, therefore, complaining about the inadequacies of politicians and the media, but when industry itself fails to flag up the problems, it has only itself to blame if no action is taken in mitigation. Right across the board, industry and trade bodies need to look very hard at their own performances. They have hardly done their members justice.